Tourmaline, Quartz and Calcite are three crystals that store and hold energy. Quartz in its natural state is both a piezoelectric and pyroelectric. The act of applying pressure, heat, or holding in your hand changes the stone from a positive polarity to a negative. 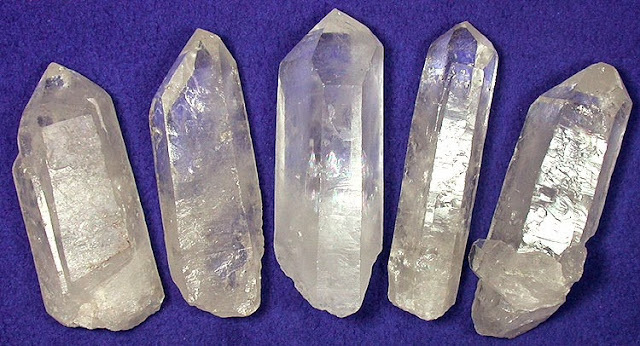 While positive the quartz crystal is capable of receiving energy from the environment. When changed to a negative through heat and/or pressure the quartz crystal will emit energy from the tip or edge. These properties support the focusing, storage, amplification, and transfer of energy. The quartz crystal is a valuable tool for spell crafting and baneful workings. All quartz crystals have this property: rose quartz, smokey quartz, citrine, and amethyst.